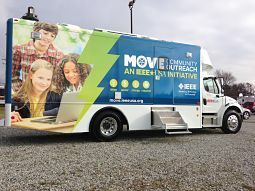 MOVE Community Outreach, an IEEE-USA Initiative - IEEE Foundation, Inc.
IEEE is offering a mobile emergency relief program committed to assisting victims of natural disasters with short-term communications, computer, and power solutions. These temporary emergency relief provisions will help people stay connected and make sure they can access the help they need. Services will include cell phone charging, and lighting to disaster victims. Natural disasters have tragically altered lives, cities and communities around the world. Power is a critical component to have readily available during these challenging times because when power is lost, people have no means to recharge cell phones, no fuel, no lights, and no way to reach out or receive communications. Fear ensues and victims feel isolated and lost as with Hurricane Sandy and Katrina. The IEEE USA MOVE truck and its volunteers help facilitate the recovery efforts.